Original fragment of NWA 5789. 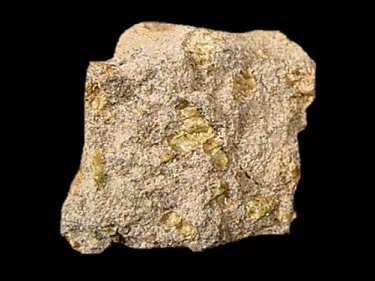 History: A small chip from one of three crusted stones found together in Morocco was sent from a dealer in Erfoud to Greg Hupé, and subjected to preliminary testing at UWS. Subsequently the stones were purchased in May 2009 by Stefan Ralew and Martin Altmann. [Moroccan dealer had no intentions of selling to Hupé, just used for confirmation]. Classification: Achondrite (Martian, olivine-phyric shergottite). This specimen has mineralogical and bulk compositional similarities to Yamato 980459/980497, but differs from those stones in having very little mesostasis. 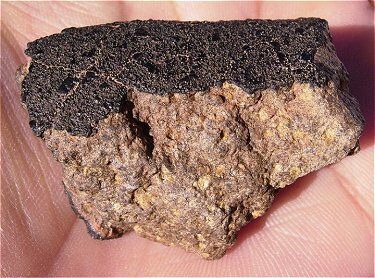 Petrologic, elemental and isotopic characterization of a recent Martian Fall in Morocco (abs#2510). Matzen A.K., Beckett J.R., Baker M.B. and Stopler E.M.
(2011) Fe2+-Mg partioning between olivine and Martian basaltic melts (abs#5528). 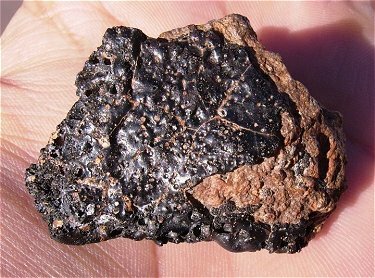 Meteorit. & Planet. Sci. 46, A150. (2010) Acid volatile sulfur isotopic composition of seven Shergottites from Northwest Africa (abs#2341). Gross Juliane, Treiman A.H., Filiberto J. and Herd C.D.K. history imply a magma similar to Yamato-980459 (abs#1813). Lunar Planet. Sci. XLI, 287-288. V.H. Hoffmann1,2, M. Funaki3, M. Torii. 980459 OLIVINE PHYRIC SHERGOTTITES. (abs#5338). Irving A.J., Kuehner S.M., Herd C.D.K., Gellissen M., Korotev R.L., Putchel I., Walker R.J., Lapan T.J. and Rumble D.
Northwest Africa 5789: A primitive magma derived from depleted Martian mantle (abs#1547). One of three fragments from NWA 5789 - View 1. One of three fragments from NWA 5789 - View 2.